Bring a large pot of salted water to a boil. Blanch the corn for 2 minutes, then grill. Cut the kernels off the cob with a sharp knife. (Trader Joes’s has roasted corn.) Whisk together olive oil, lemon juice, garlic and balsamic, taste for salt and pepper. 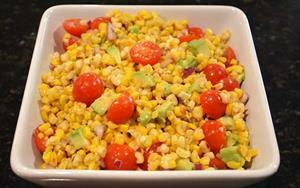 In a large bowl add corn, tomatoes, red onion, basil and mix together with dressing, gently fold in avocado. Season with salt and pepper. Serves 6-8.